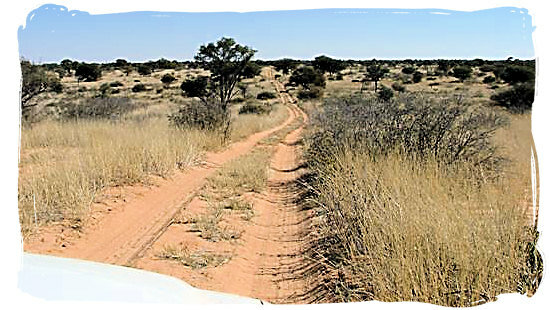 Gharagab Wilderness Camp, a unique African wilderness setting in one of the remotest corners of the Kalahari desert. 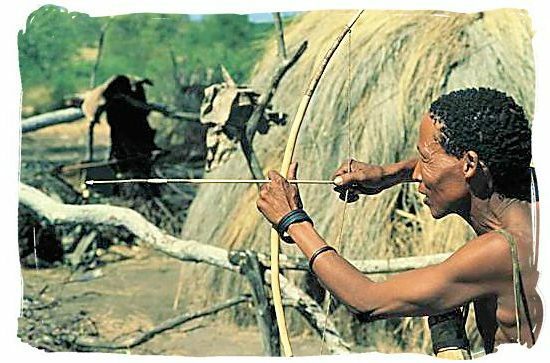 The camp is situated in the far northern region of the Kgalagadi Transfrontier Park, a four hour drive north from Nossob main rest camp, not far from Unions End. Elevated above the blistering sands and typical Camel Thorn veld of the Kalahari, the camp is designed toblend well in with its unique setting. It has the ideal environment and ambience to help you escape from your normally strenuous lifestyle and become one with nature. Guests must bring their own food, drinking water and fire wood or charcoal. The nearest shop and fuel supply is at Nossob, where guests who have booked for Garagab also have to check in. The camp is not fenced and for your safety an armed game ranger is permanently based at the camp. Usually the camp is only accessible with 2x4 and 4x4 vehicles via a one way road. Travelling to the camp, you truly get the feeling that you are the only person on earth. 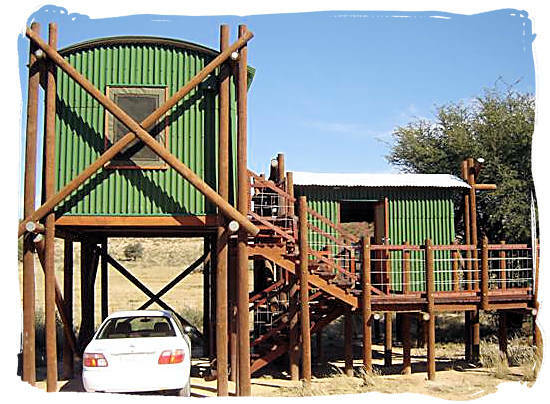 The camp accommodation consists of four log cabins, elevated on wooden stilts and overlooking a waterhole. Outside the units have a wooden deck with stunning view and each deck is equipped with a "braai" (barbecue). Each unit It comprises a long tent with well equipped kitchen with gas fridge/freezer and cooking plates in front, a bedroom with two single beds in the middle section and en-suite bathroom with w/c and shower at the back. The fittings, layout and appearance of the units are well thought out and of a high standard. 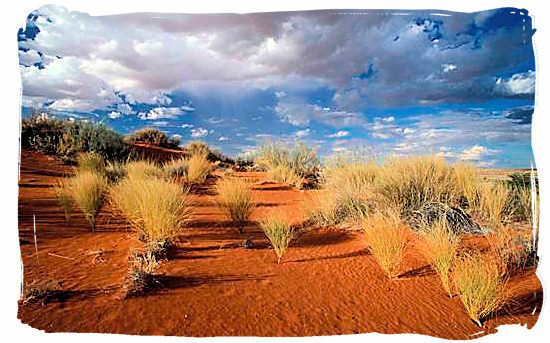 The units provide the visitor with a safe haven, an oasis in the heat of the Kalahari. 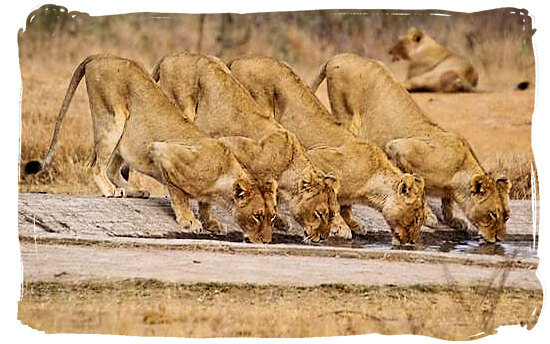 During day time game can be viewed from each private deck as they come to quench their thirst at the centrally situated waterhole beneath the accommodation, followed by a breathtaking Kalahari sunset at the end of the day. The peace and quiet of Gharagab is balsam to your soul. Breakfast: Amarula coffee and rusks, and cold pizza. Packed over from the caravan and trail van into the vehicles as we were going up to the Gharagab bush camp and trailers were not allowed. Left the 'vans at Nossob and drove up to Union's End. Awesome lion and leopard sighting en route. 32km of track driving to get to the lovely bush camp. Four bush tents that consist of a balcony that overlooks a well used water hole, kitchenette with gas stove and fridge, two single beds with bedding, a bathroom and a separate shower in each tent met us. During the early hours a pride of lions visited the camp (as it is not fenced) and we received a pretty hair raising wake up call by them roaring outside my tent at 2:30am. They drank from the water hole and then moved on. Breakfast: Amarula coffee, rusks and left over fillet. A game drive showed loads of lion spore, but only a few Gemsbuck and jackal. Supper: Spare ribs and "wors braai" with salads with freshly baked bread. The resident ranger was invited to join us but didn't arrive. Go to SANParks.org to view rate and tariff details for Gharagab wilderness camp on the South African National Parks (SANparks) organization’s website. Go to SANParks.org to book your reservation for the Gharagab wilderness camp on the official reservations page of the South African National Parks (SANparks) organization's website.